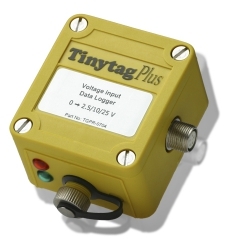 The TGPR-0704 is a voltage data logger supplied in a robust, waterproof case. It monitors voltages from 0 to 2.5/10/25V and can be used to record the output from a variety of industry standard sensors for a wide range of applications, including, for example, pressure and windspeed monitoring. This unit is supplied with an input lead (CAB-3239). Alternatively you can buy our 5-pin connector plug (ACS-9703) to connect to your own probe/sensor. You have the option of purchasing calibration certificates with our loggers. If you don't order calibration, we guarantee the accuracy figures on our datasheets at the point of purchase.